N.B. If anyone has a spare copy of this single, please get in touch! 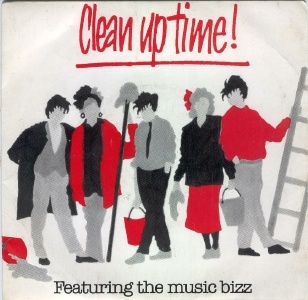 The Music Bizz - Clean Up Time! 1987 was the European Year of the Environment (EYE) and one of the associated activities was something called National Washday (11 May). A 7" single with this title was released during the year. I've no idea what it was about -- perhaps it was intended to encourage artists to bathe more often? 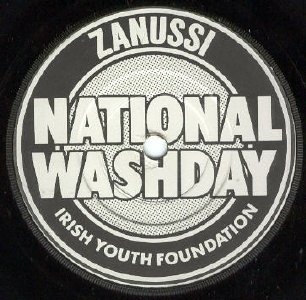 Proceeds went to the Irish Youth Foundation but in fact few copies appear to have been released. There was also a free concert in St Stephens Green in Dublin. The whole thing was sponsored by Zanussi! 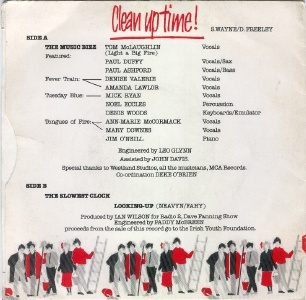 The A-side is credited to The Music Bizz who are Tom McLaughlin (Light A Big Fire) on vocals, Paul Duffy on sax/vocals, Paul Ashford on bass/vocals, Mick Ryan (Tuesday Blue) on vocals, Noel Eccles (Tuesday Blue) on percussion, Denis Woods (Tuesday Blue) on keyboards/emulator, Jim O'Neill (Tongues of Fire) on piano and Ann Marie McCormack, Mary Downes (Tongues of Fire) Denise Valerie & Amanda Lawlor (Fever Train) all on vocals. The track was written by S.Wayne/D.Freeley. The latter must be Dave Freeley of Alto Studios. It's pretty bad! 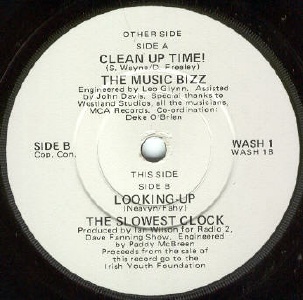 The B-side is an exclusive track by The Slowest Clock.